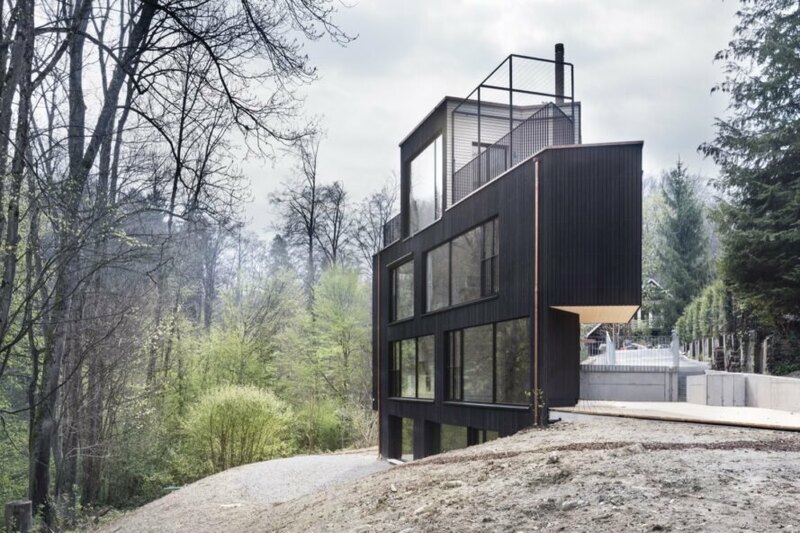 In the midst of a centuries-old forest sits the Two Family House, an aptly named project that houses a pair of maisonette apartments for two families at the edge of Zürich, Switzerland. 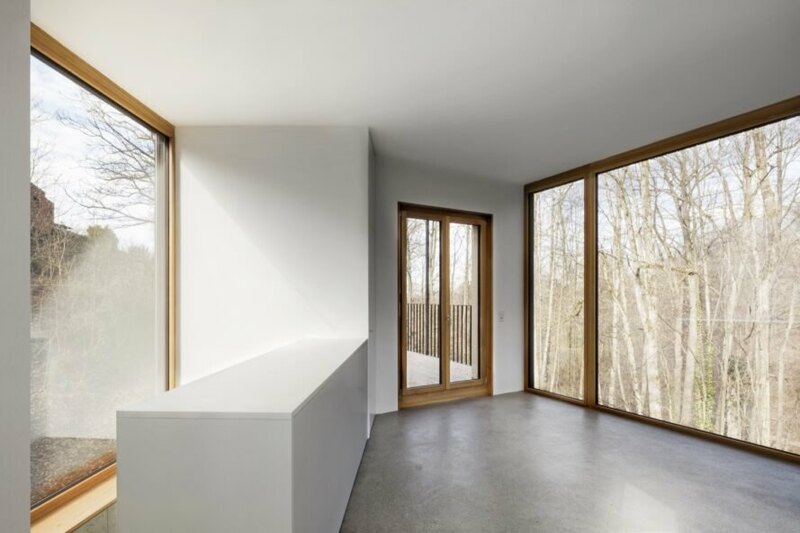 Local architecture firm Hajnoczky.Zanchetta Architekten collaborated with architect Angela Waibel on the design, which takes advantage of its wooded location with full-height windows that capture views of the changing landscape. Due to regulations that enforce minimal disturbance to the landscape, the building’s unusual triangular shape is dictated by the forest, which diagonally divided the parcel. 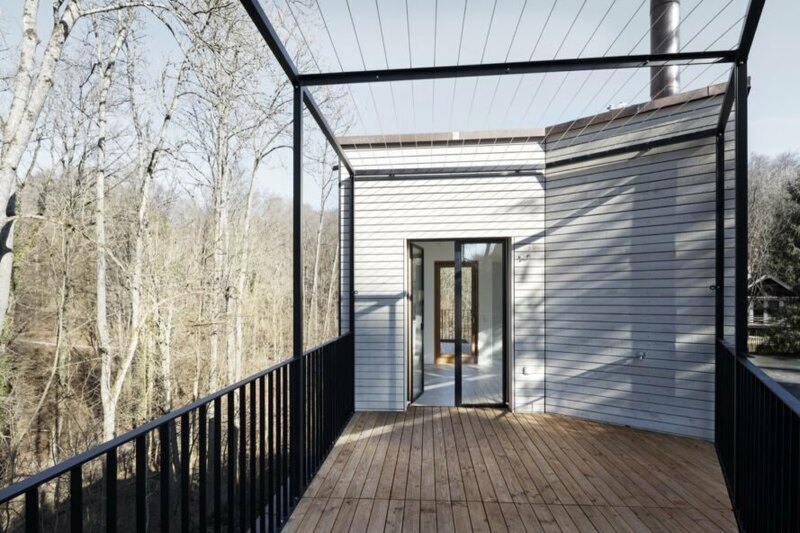 To fit two homes onto the constrained space without compromising space and comfort, the architects used the slope of property to vertically separate the two apartments. Each of the four levels has a slightly different floor plan and size; the upper floors, for instance, have cantilevered elements, such as projecting windows, that increase floor space. 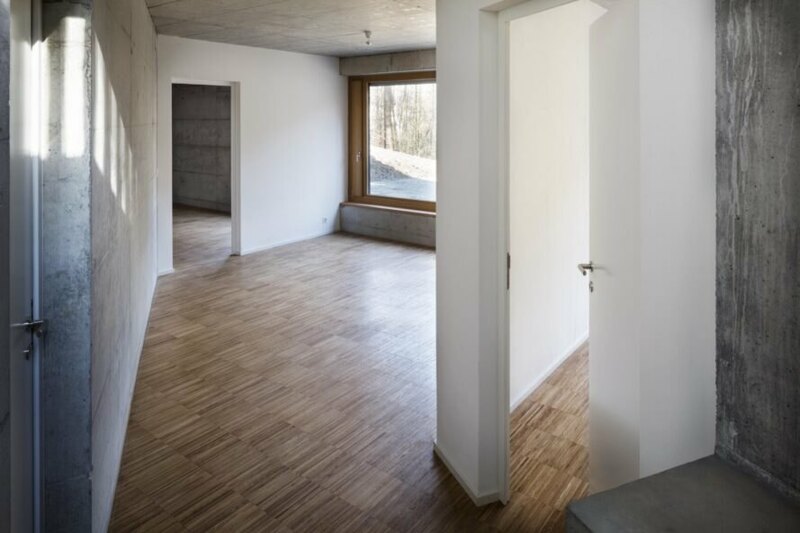 The larger of the two maisonette apartments occupies the ground floor, which comprises the bedrooms, and the first floor, where the communal spaces are located. Since the building is set into the existing slope, both the ground floor and first floor have direct access to the gardens. The second apartment occupies the uppermost two floors. To make up for the smaller footprint, the upper apartment has access to three rooftop terraces. The building is primarily a timber-clad concrete structure, aside for the topmost level, which is built of timber construction. 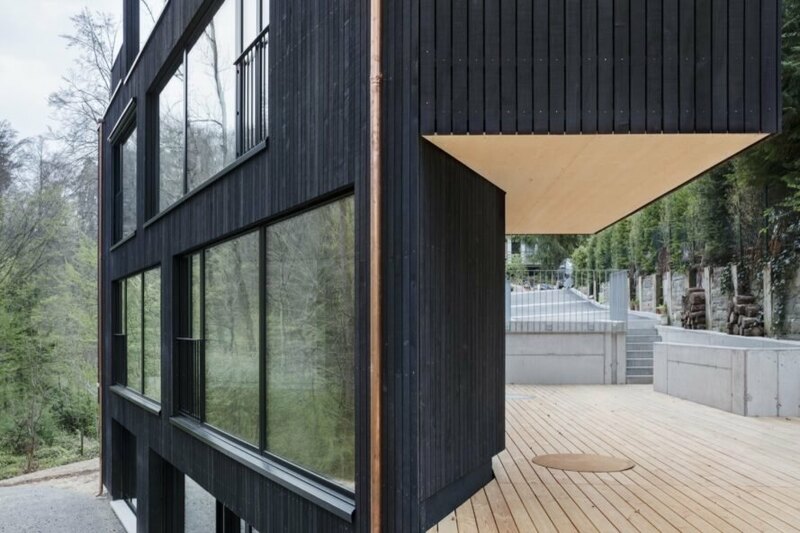 The Two Family House project houses a pair of maisonette apartments for two families. 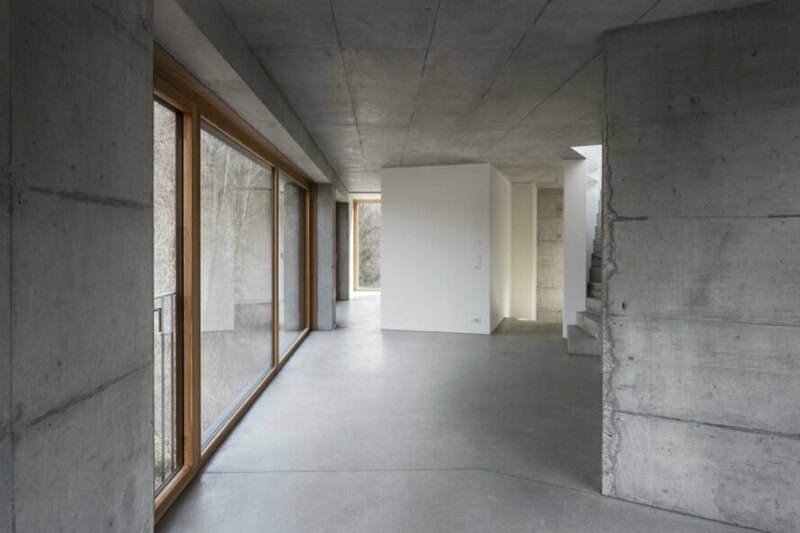 The Two Family House is located at the edge of Zürich, Switzerland. 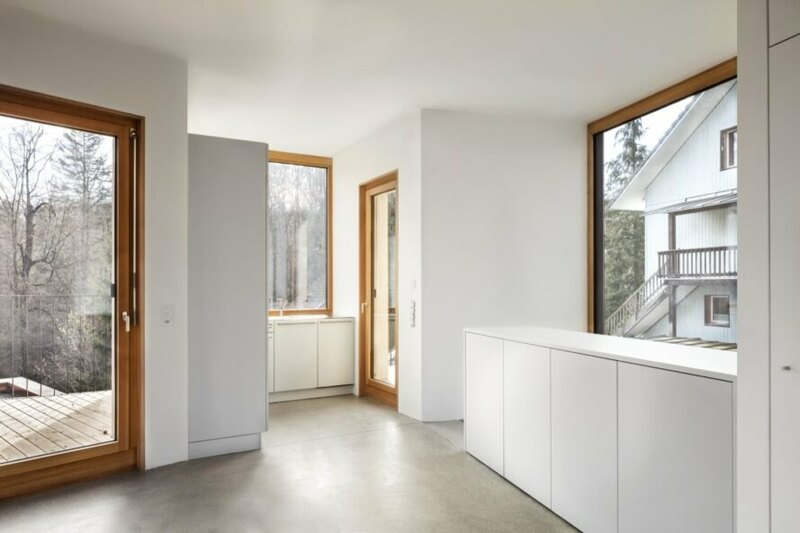 Local architects Hajnoczky.Zanchetta Architekten collaborated with architect Angela Waibel on the design. The home's unusual triangular shape is dictated by the surrounding landscape. Each of the home's four levels has a slightly different floor plan and size. The larger of the two maisonette apartments occupies the ground floor. The second apartment occupies the uppermost two floors. The upper apartment has access to three rooftop terraces. The ground floor and first floor have direct access to the gardens.